Update: Logitech now has a policy where you need a receipt or invoice to receive warranty service, which means if you got your mouse as a gift, or from a brick and mortar store a long time ago you’re screwed. Because of this consumer-unfriendly outlook, my next mouse will be a Razer. I’m a big fan of Logitech’s Gaming Hardware, I own the Z-4’s (solid value in 2.1 audio), a G510, as well as a G930 headset. Every now and then there’s a driver hiccup, but for the most part they’ve all performed admirably. But one piece of hardware has been consistently problematic: The mouse. It all started back in the day when I was still using the venerable Logitech MX-518, one of the best-feeling in hand mice if you weren’t looking for the flat profile of a Razer. It had brilliant ergonomics, but after a year or two it started cutting out. I’d be playing games, and hear Windows chiming in the background that something was repeatedly disconnecting and rapidly reconnecting. Then the delay between disconnect-reconnect started growing until it affected my gameplay, my mouse would stop responding for a couple seconds at a time. I figured it was the cable, so I isolated where the fault was (right by where the USB cable enters the mouse body) and coiled up the cable with a twist-tie so that it would be in a fixed shape and not introduce breaks in the wires while moving the mouse. I later learned that some people would simply open up their Logitech mice and feed a small length of the cord into the body of the mouse to achieve the same thing (frowned upon by customer service… something to do with warranty nonsense). This fix held me over until my next mouse upgrade, which came courtesy of my ex who I have to give props to for her research. For a bit over a year now I’ve been using a G400, the spiritual successor to the MX-518. Same shape and ergonimics, with slightly more plastic-y but durable material selection. The driver and software worked great, and I was really pleased with the mouse. But recently, the same symptoms started creeping up. Intermittent disconnects while gaming. And it’s happening with increasing frequency. And I know it’s cable-related. I wondered if it was me, maybe I was an abusive owner (even though I transport it in one of those bubble-wrap envelopes when going to LAN parties). But then I heard my friend was having issues with his own G400. He told me the LED wouldn’t even light up when plugged in. I checked it out for myself and found that he had a break in his cable in the exact same spot as my MX-518. It just happened to be such that in the cord’s natural position the mouse would not receive power. The problem stemmed from a lack of strain relief where the USB cord enters the body of the mouse, and for “premium” mice that use thinner USB cables that’s a death sentence. If you look at a mouse like my brother’s Razer Deathadder, there’s strain relief built in. Smart. And braided cables. Sweet. But there was a change to the hardware, and Logitech didn’t discuss it. 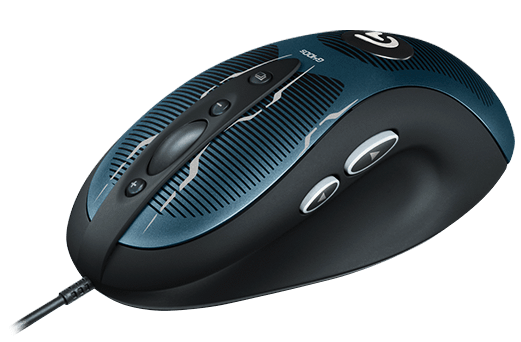 If you look at a closeup of the G400s, you can see that Logitech quietly added strain relief to their mice. I’m betting one of the reasons Logitech didn’t draw attention to the design change was because it would be an admission that their previous gaming mice were defective. It was practically planned obsolescence, and it would probably cause some uproar among all the other gamers who had reported issues to Logitech CS. I’m honestly not sure whether or not I want to go with Logitech for my next mouse. I like their designs, but I feel a tad pissed at them for not doing a recall or having an official cable replacement policy. There are plenty of other great options on the market, and I’d be willing to go without the same level of software-based dynamic DPI adjustment for my FPS needs. ⟵My CNC takes its first steps. Hello World.